Vital process information needed for operation not available. Ease of maintenance for PLC & SCADA development / modification as all will be Unique. Preparation of Functional Design Specifications (FDS). 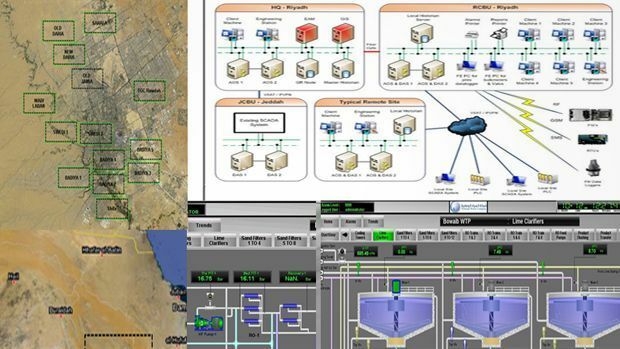 System Design and configuration for RCBU WTP & Stations SCADA upgrade sites. Modification of the MCCs, cable laying, termination to include all sections and 3rd party systems for remote control and monitoring. FAT & SAT documents for the system. Upgrading the PLC CPUs and connecting Bulk meters signals to new/Old RIOs. Testing communication with Central GR at HQ. It’s an Infrastructure SCADA project for the whole city and as we executed the Central SCADA for whole Country it is a Unique achievement that other companies. Water Treatment Plants : 7 no. Lifting stations : 10 no. Booster Stations : 29 no. Deep Wells : 124 no. Complete stations data is available for operators. At a glance he can get the overall status of the stations complemented with Statistical Process Data, Alarm, Trends. Various reports for plants managers, RCBU operations managers and High level management are available. Control the demand of water for Riyadh city and control main feeders from SWCC . More control of distribution of water and Water balance after connecting most of Booster stations to central SCADA as all capacity of distributed tanks and stations are monitored. All the sections in the stations are operated through a single local SCADA. Less downtime as Alarm system sending reports to operation team.